Last week’s stall passed almost completely without incident, which is such a rare occurrence we thought it merited a headline. The blustery spring weather undoubtedly contributed to keeping business to a minimum: the breeze was so bitter that a guy I spoke to complained it was ‘stripping the skin affa my puss’, and driving hailstones forced us, on a couple of occasions, to cover up the stall and seek out corners of the buroo that offered any kind of shelter, however minimal. It is little wonder that folk, rushing by with hoods up and heads down, were reluctant to stop and chat. However, there are some who, irrespective of the weather, conspicuously ignore us when we ask them if they’re having any problems. They pass quickly by staring fixedly into the middle distance, often with a muffled tune emanating from their headphones. Whilst this annoys some of our activists, being ignored is actually a good sign, as the folk that are guilty of it are unlikely to have any pressing issues that need to be addressed. Others answer us with another question, ‘why should I hae problems when meh work coach is braw and ahm daen ahin ahm supposed tae’. 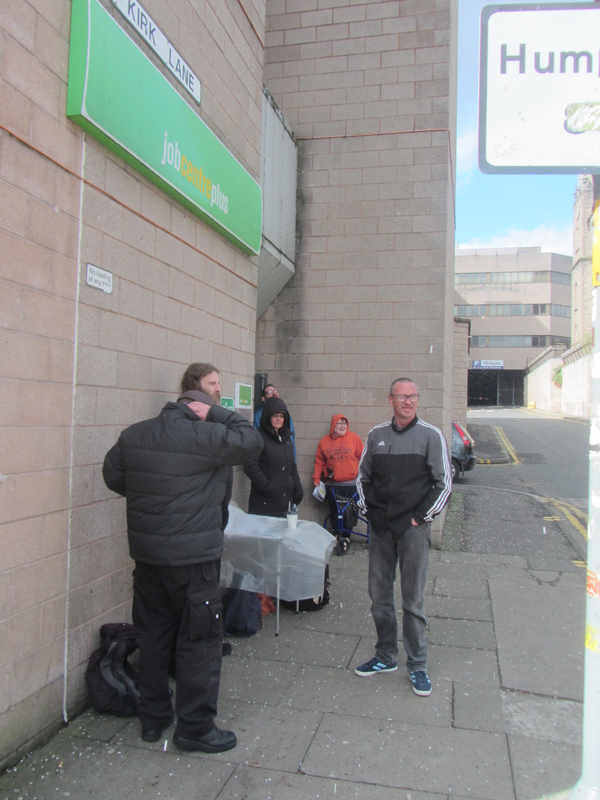 There has, indeed, been a marked improvement in the attitude of many Dundee Jobcentre staff towards welfare claimants – which we would claim some credit for – but, despite doing everything required of them, many claimants can still end up entangled in the UC spider web. We also meet some folk who pointedly refuse to take the ‘Know Your Rights’ leaflet that we offer them when going into the buroo (including staff, who, as we often remind them, can also be sanctioned). On more than one occasion we have had guys (it’s always young guys) informing us, ‘I ken mah rights, pal, ahll well soart them if they gie me ony shite’, only to have them re-appear fifteen or twenty minutes later complaining bitterly and loudly that ‘ahv jist been bloody sanctioned’. Other folk tell us that they already have a leaflet pinned on their fridge, but take one to pass on to friends and/or relations. And, it is always gratifying to hear, as happens regularly, that the leaflets have helped folk sort out problems on their own, without our aid. So, what do welfare activists do on the stalls when it is quiet? Firstly, few of our stalls can be described as ‘quiet’: familiar faces and freends and comrades often stop by for a bit of advice or simply for the craic and to pass the time. The stalls can often become a debating forum, sometimes involving dodgy conspiracy theories that passing ‘local worthies’ insist on regaling us with. Debates often develop amongst us activists as well, covering a wide diversity of subjects from Brexit to the mating habits of herring. 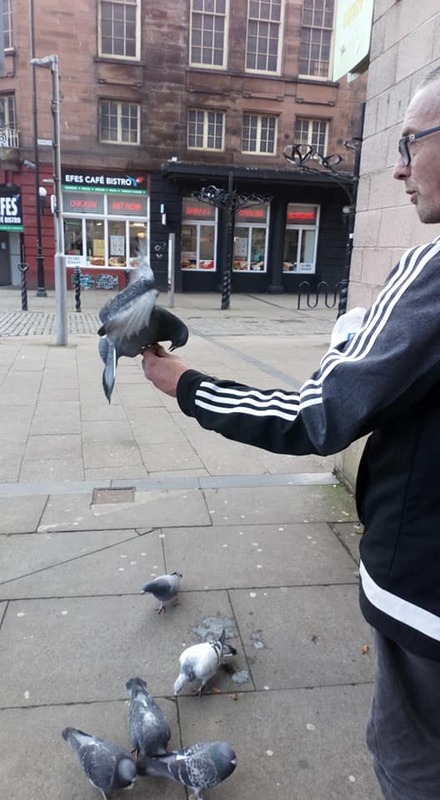 And, of course there’s always the doos’ to feed, courtesy of the birdman of Dundee buroo. Duncan, Jock, Norma, Tony, Gary, Jonathan and Katie were on this weeks stall.